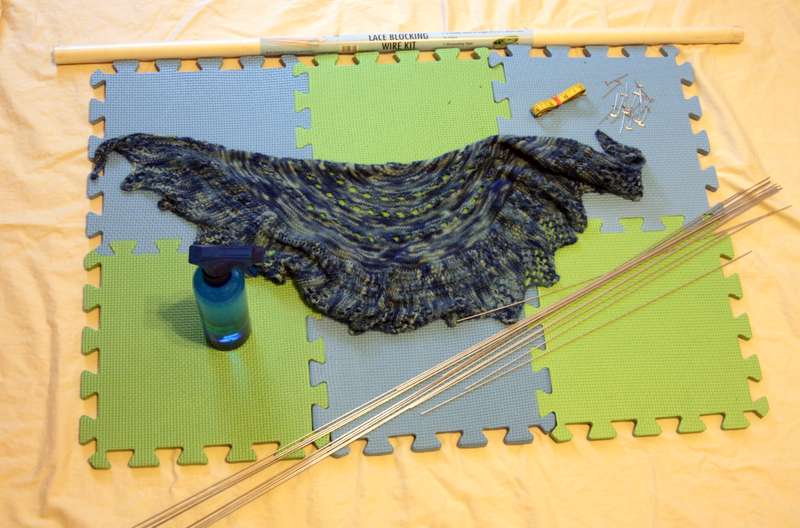 Gather your supplies: a set of Knitter's Pride Blocking Mats and a Lace Blocking Wire Kit which includes 15 stainless steel wires, 15 rust-resistant T-pins, and a measuring tape. You may also wish to have extra T-pins on hand. Wet block your piece or use a spray bottle to dampen the piece in preparation for blocking. Beginning with the straight edge of your piece, pick up each stitch along the edge with a wire. The more stitches you pick up, the neater your edge will be. When all of the straight edge stitches are picked up, lay flat on your blocking mats. 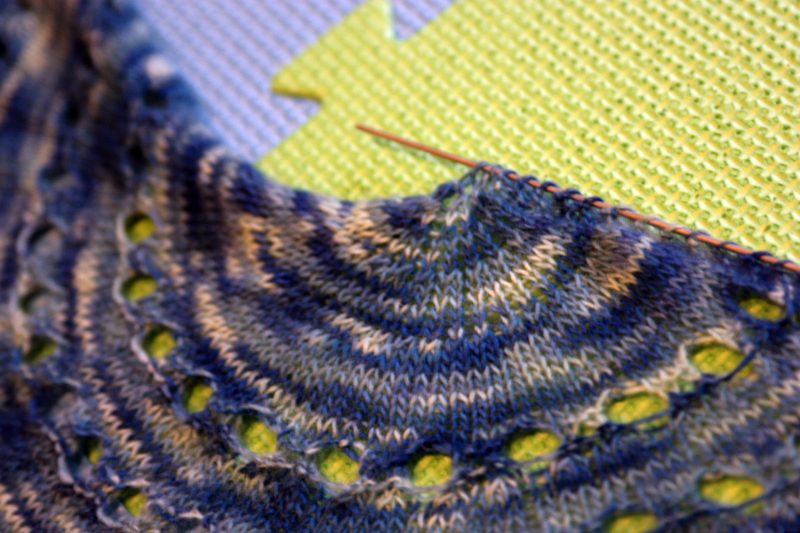 Beginning at the center, insert t-pins between the knit edge and the wires. This is a great time to make sure your piece has the correct dimensions; feel free to make any adjustments necessary before proceeding to the next step. Beginning at one top edge, use a blocking wire to pick up one stitch from each point along curved shawl edge til you reach the center. Adjust the fabric until you are satisfied with how it looks, then use a few t-pins to stabilize wire as you did in step 4. Repeat for other side of shawl. Once your piece is dry, carefully remove the pins, then the wires. Enjoy! Congratulations are in order for Heidi A, who was randomly selected to win this month's prize, a Knitter's Pride Lace Blocking Set. Heidi commented, "My knitting resolution is to finally publish some patterns. I have several first drafts; I just need to see them through to completion! " We have contacted her via Ravelry to arrange for prize delivery. Thanks to everyone who entered our giveaway this month! Happy New Year! We're looking forward to an exciting year filled with non-stop crafting, learning and sharing. There is no shortage of new knitting and crochet techniques to try, and we hope our products will help you on your journey this year. This month, we'd like to share some of our favorite tips and tutorials for knitting and crocheting lace projects. First, you'll need to be comfortable reading (and working from) charts. While it's true that several patterns will include both written and charted instructions, many patterns include only charts due to space constraints or designer preference, so it's a good skill to have under your belt! Luckily, there are plenty of free tutorials available in the knitting blogosphere: Wisehilda Knits, PicnicKnits, and Wendy Knits all have shared very informative posts on this topic. You can find even more via Google, Youtube and Pinterest, too - isn't it nice to have options? Having the right tools is another important consideration. 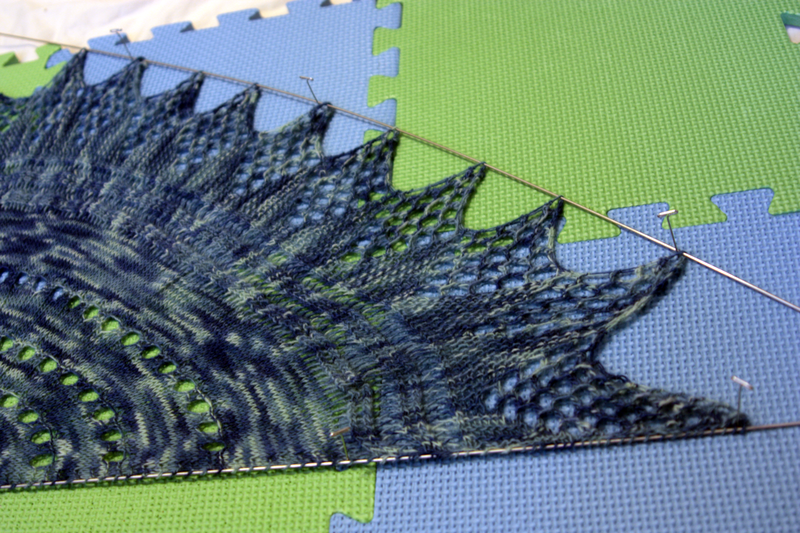 Many lace knitters prefer sharp needles and metal tips which allow the stitches to glide freely and quickly. We recommend trying our Karbonz or Nova Cubics needles for your next lace-knitting project, or our color-coded Waves hooks if you're planning to crochet your next lace project. Stitch markers can also help you keep track of pattern repeats or where you need to increase or decrease as you work. The real magic is in the finishing, however! 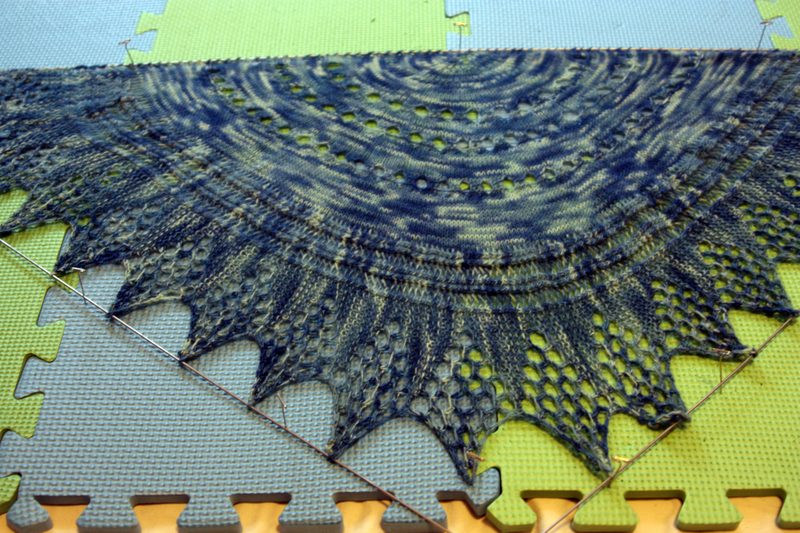 Blocking your project properly will enable the lace pattern to open up, causing a dramatic transformation for many projects. This is where blocking wires come in handy: they can save you time and effort in blocking your project out to a specific shape. Patterns featuring scallops or points can especially benefit from blocking wires, though you can also use them to easily create a straight edge on just about any project. You'll need T-Pins to get the job done, and in general, blocking is much easier to do if you have a soft surface such as our new lace blocking mats. 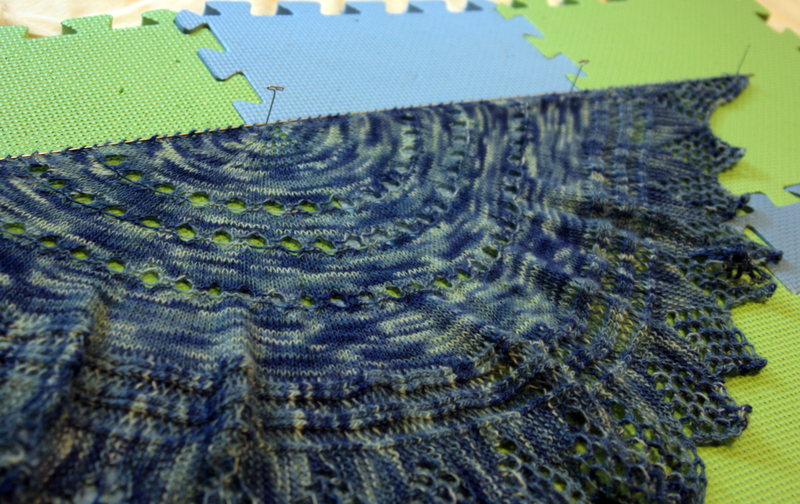 There is an excellent article about the ins and outs of blocking here in the Knitty archives, but in our next blog post, we'll show you how to block a lace project step-by-step using Knitter's Pride products. 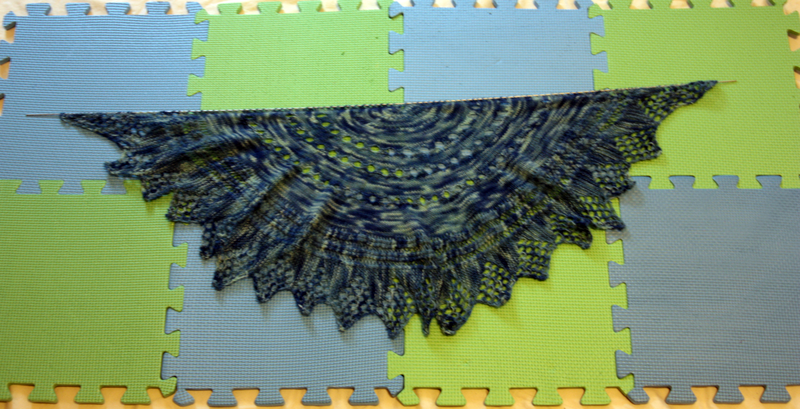 We'll also be giving away a Lace Blocking Wire Kit to one lucky reader! To be eligible, simply leave a comment on this post telling us your craft-related new year's resolution; be sure to also mention your Ravelry ID or email address so that we may contact you if you win. The Knitter's Pride Lace Blocking Wire Kit contains several stainless steel wires in various lengths (15 total), 20 rust-resistant T-pins and 1 measuring tape! We will randomly select a winning comment to announce on our next blog post on Friday, January 24, 2014. Good luck!